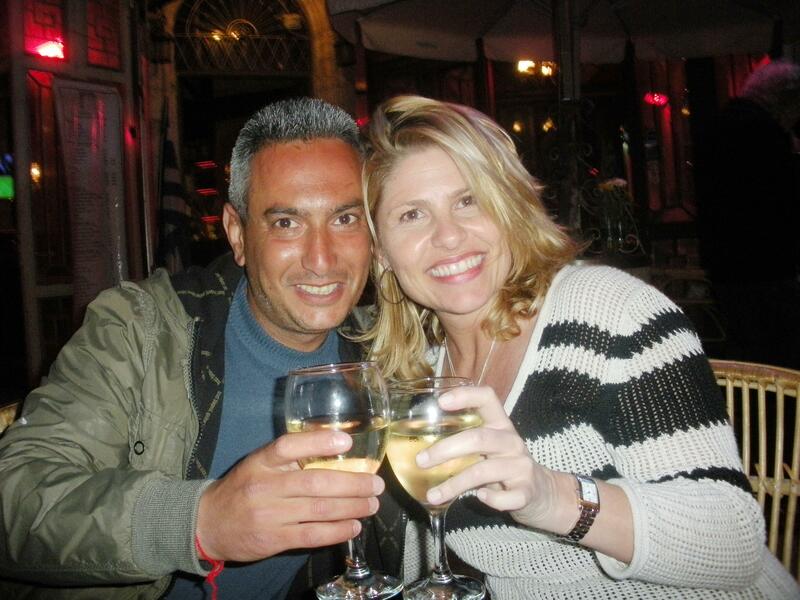 Just sitting outside Jaffa Gate with a glass of Galom Savignon Blanc… waiting for lunch. Jerusalem is quite the wonderment! For certain elevation experts: it is 3,600 feet. 🙂 So it is mountainous and absolutely spectacular. Beautiful architecture with all the Jerusalem stone (limestone)… which I’ve learned is a law for new buildings, on the outside. All buildings must have the stone on its exteriors to maintain the look of this fabulous city. Everything is literally ancient, but looks so clean and pretty. I’ve just had my first little overwhelming stroll on Street David in the Old City, in the Jewish Quarter. 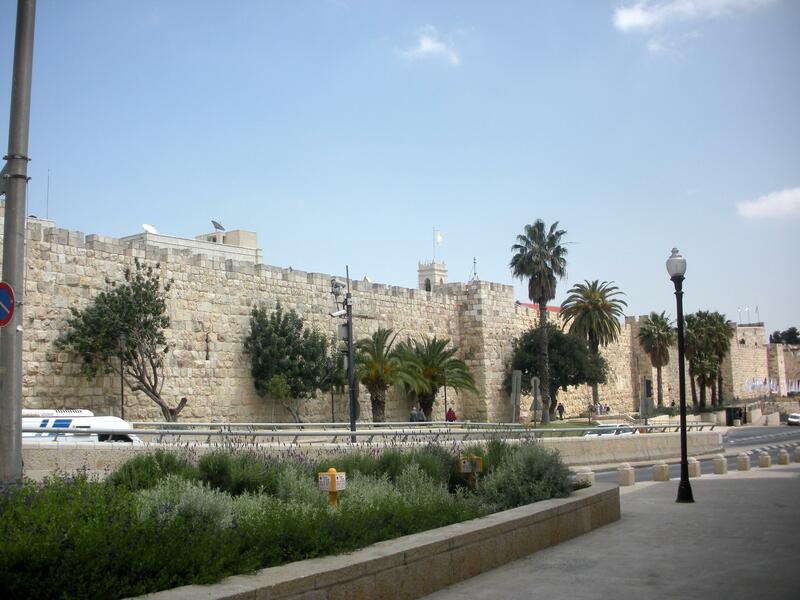 Inside the walls of the pictured Jaffa Gate. Thankfully my taxi driver (who drove me by Peres’ garden and gated home) from Tel Aviv yesterday told me to go a couple rounds before buying. The blonde hair (as my boyfriend Zac would attest to if he could only speak) is a hit. Seems everyone wants to comment on it as I walk by! On my one hour stroll-through, I was fallen in love with twice, taken to the ‘rooftop’, proposed marriage, broke someone’s heart and had a simple offer to go dancing tonight. Moti even told me he is going to ship me the $2,700 USD (which quickly became $1,950, then $1,500, then $1,300) silk rug, at no charge at all and to expect it at my home soon… because he loves me and I am ‘sweet’. Ha. He obviously doesn’t know me well. 😉 Fortunately I have a great friend in the US who has plenty of beautiful rugs should I *really* need one. These Israelis are def aggressive. I love that they give you tea or coffee, or pomegranate juice while they try to make their sale. I chatted with my new friends over tea and silk rugs, and got us beyond the ‘business’ and was chastised for not knowing a THING about religion. I was given, as a gift, a silver hamsa pendant with the eye of David in amethyst, to watch over me. Very sweet. I’ve just finished a bit of lamb and am going back in there. What will my Jerusalem purchase be? The Roman glass necklace, my first spotting from the best salesman, Fares? Or Beni, with his local art? Seems the Israelis have uncovered my weakness for local jewelry and paintings. I’ll have another glass of wine and see how far down I can talk them in cost. Round one: I was intimidated. Round two: I’ll go in there ready to roll. Will there be a need for Round Three? 🙂 I’m thankful for the flips tip, given all the wet stone on the ground! My heeled boots would have made me not want to return at all. I like it here! FAR better than Tel Aviv. It really is something extraordinary. Highly recommend it. Oh! And they play the real CNN! The King David Hotel… it is overwhelming to think of the dignitaries and remarkable history of this exquisite property. There are so many famous names and signatures along the walkway. Like *really* famous, really significant people. Not like London hotels’ claims to Brad Pitt and Mariah Carey, or freakin’ Simon Cowell. I mean world leaders and true legends of our time. Funny (odd funny) to hear the boasting of Egypt’s Mubarak in room 303 not so long ago. Anyway, my seven roots salad is about done and I need to go take a picture of the Armenian Quarter for my Armenian friend. Even though he is the one now that it is so hard to get a response from! Oh how the tables can turn. 🙂 I love life. Def needed some wine after the rug sale and the educational tour!